The mention of French cuisine frequently conjures visions of fancy pâtés, escargot, and rich desserts. French sandwiches normally are not part of that image and yet they hold a special place in the culinary repertoire. A simple baguette is the preferred bread for sandwiches made in France, although the baguettes are smaller in size than traditional sticks of bread. The only deviation from this is the crustless pain de mie bread used to make a croque monsier (see recipe below). 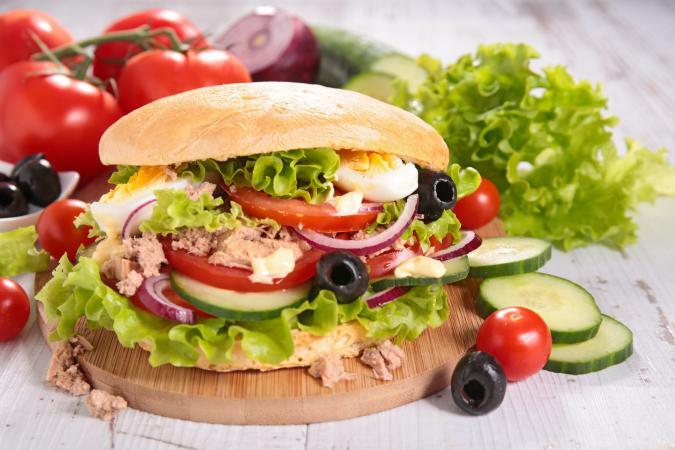 Common filling ingredients are simple meats, cheeses, lettuce, tomatoes, sliced hard-boiled eggs, olives, and a thin layer of top-quality butter and sometimes Dijon mustard. The French are not fond of sandwiches stuffed to the gills, nor are they big on condiments like mayonnaise and ballpark mustard as Americans are. Instead, they prefer a modest amount of filling so their true flavors can shine through instead of being swallowed up by a condiment. Jambon-beurre: This is a sandwich made with thinly sliced ham on a lightly buttered baguette with nothing else (no tomato, lettuce, or sauce). 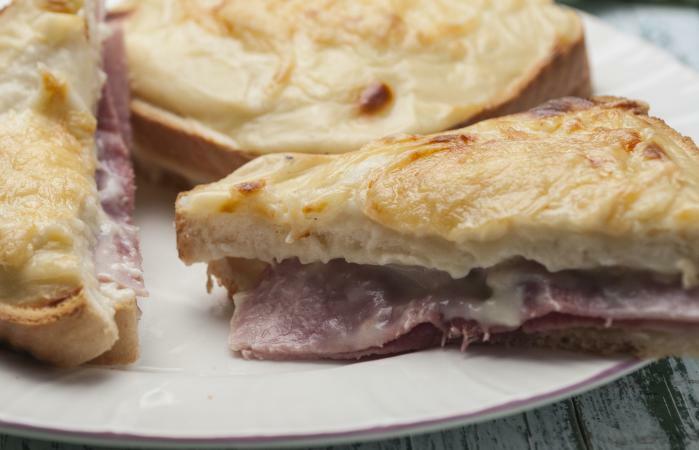 Jambon-fromage: Make the same sandwich as a jambon-beurre (above), except the jambon-fromage features the addition of thinly sliced Gruyère or Emmental cheese. Jambon-fumé: Smoked ham is used in this sandwich that is similar to a jambon-beurre but the ham in that sandwich can be cooked or raw like prosciutto - but not smoked. Poulet: Poulet is typically a sandwich of sliced chicken breast on a baguette with vinegar-and-oil dressing or Dijon mustard with lettuce. Poulet-crudités: This is a sliced chicken breast sandwich on close-crumbed sandwich bread or a baguette with lettuce, red onion, shredded white cheese, chopped fresh coriander and chives, sliced tomatoes and cucumbers, olive oil, vinegar, salt and pepper. Saucisson: Grilled sausage, usually air dried and often spicy, is rolled in flattened pain de mie or placed in a baguette and dressed with Emmental cheese and Dijon mustard. Canard: Similar to a sandwich au poulet (chicken sandwich, above), a sandwich au canard is made with slices of duck breast on a baguette and dressed with vinaigrette or mustard and lettuce. Sometimes duck confit is used to make a more decadent sandwich. Thon: Tuna sandwich on pain de mie is made with canned tuna, mayonnaise, ketchup, and cheese. Pain bagnat: This traditional sandwich, also spelled pan bagnat, is typically served on round bread rolls or baguettes features lettuce, tomatoes, hard-boiled eggs, tuna, anchovies, cucumbers, fava beans, artichokes, green peppers, radishes, onions, basil, and black olives dressed with a garlicky vinaigrette. Omelette: A sandwich à l'omelette is a simple omelet with optional bacon, chives, salt and pepper served on a baguette or between two pieces of pain de mie. At first glance, this recipe looks like nothing more than a grilled cheese sandwich that Americans have been making for centuries. It even calls for plain sliced bread instead of the traditional baguette. But don't be fooled. Accounts of people becoming dewy-eyed with emotion after tasting a croque monsieur are widespread. Note that even though this French sandwich name literally translates to "crispy mister" in English, the verb croquer also means "to bite into" and "to make a crunchy sound," which is the case with this grilled treat served with a sauce. Many believe it is the inspiration for the American Monte Cristo sandwich. Another French version of croque monsieur is croque madame which is essentially the same sandwich except a fried egg is placed atop the sauce. In a medium bowl, mix together the grated Swiss or Gruyère cheese and cream or half-and-half and divide it evenly among the slices of bread, smoothing the mixture evenly on top. Top each bread slice with a piece of ham and close to make four sandwiches. Beat eggs until slightly frothy in a shallow dish big enough to hold the bread. Add the 1/4 cup milk and salt to the egg mixture and stir. Gently dip both sides of the sandwiches into the egg-and-milk bath. Melt the butter in a skillet or on a griddle and brown the sandwiches on both sides until the cheese melts. Melt 1 tablespoon butter over medium heat in a medium-size saucepan. Whisk in the flour and dry mustard until smooth and well blended. Take the pan off the heat and slowly blend in the 1 cup milk. Return the pan to the burner and heat to boiling, stirring constantly. Boil for 1 minute, remove from heat and stir in shredded cheddar cheese. After the cheese melts into the sauce, pour it into a small ramekin and serve alongside the sandwich as a dipping sauce. If desired, garnish the plate with cherry tomatoes and pepper slices. If you conducted a man-on-the-street interview about what constitutes a French sandwich, two answers would likely dominate the responses and both would be wrong. This hot roast beef sandwich is among the top sellers at diners and cafeterias in the States. It is conventionally served on a French roll or baguette with a small cup of beef juice or beef broth on the side in which to dip the sandwich. Other than the roll, the French had nothing to do with this sandwich. Two Los Angeles restaurants claim to have invented it in 1908 and neither served it with the side of broth. The chefs dipped the roll into the cooking juices in the kitchen before they placed the beef on a serving plate. Yes, croissants are very French, but you would be hard-pressed to find a sandwich served on one in France. They are typically eaten for breakfast (perhaps accompanied by a smattering of marmalade) with a cup of dark, strong coffee. French up your next batch of sandwiches just by serving them on baguettes and using good-quality European French butter as a condiment to appreciate fully the flavors of French sandwich fillings. Or take the time to make the croque monsieur that is prepared with crustless good-quality white bread with a close crumb.